A prominent entertainment industry attorney firm needed to boost its morale and refresh its image in its west side headquarters office. In an atmosphere of increased competition from the marketplace, this law firm was feeling the effects of the spirited development and growth of a satellite office in a nearby area. 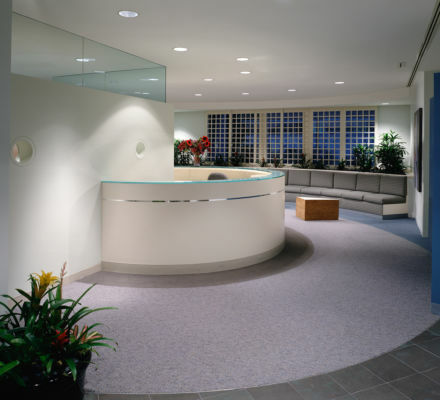 The original partners of the firm practice at the Marina del Rey office. The firm has had a history of retaining high-end design firms including Frank Gehry. In fact, upon closer review JSDA located a few collectible Gehry corrugated cardboard furniture items within internal storage. 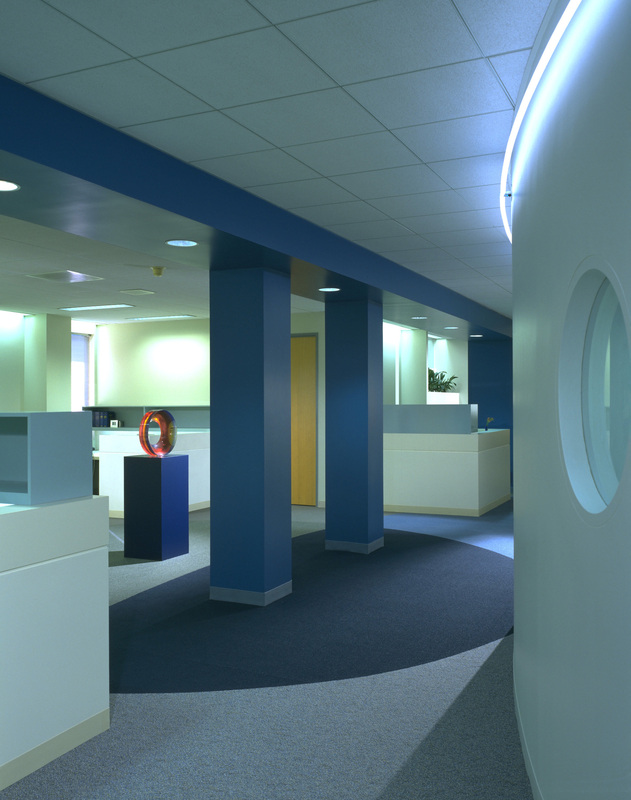 The project goal was one of re-imaging the space through new wall definition, detailing, and color and materials selections. A re-emphasis of design elements changed the appearance of the space. Portal elements were redefined. Cathode lighting was untouched. Artwork was strategically placed for greater emphasis and interest. New ceilings, low height walls, glazing details including portholes were reintroduced, visually connective devices as stylized nautical references. At the reception area, an unused space was transformed into a needed informal conferencing space. The Gehry museum pieces were returned to prominent locations. The new flooring finishes were carefully detailed to manage threshold challenges and to meet those existing conditions at the partner and associate private offices. Transitions were incorporated to new slate flooring at the large concentric elevator area. 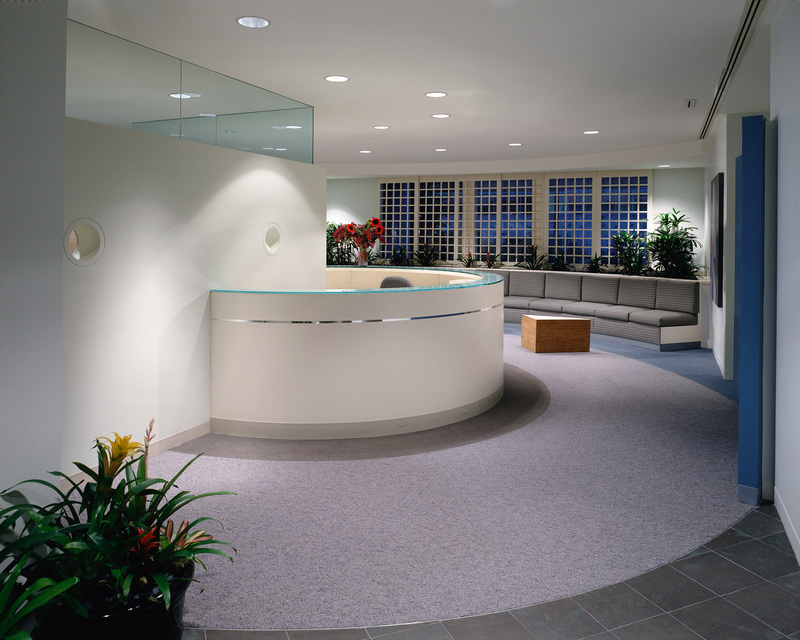 A large intersecting circular form was introduced in the flooring to depict the multiple practices of the firm, and create interest in the space, taking rise from the existing reception desk shape. Key to the success of the palette was the aesthetic balance between a new intense sea blue, and the greyed sage, which emanated from the existing materials found at the storage above desking areas. Added to the complex mix are midnight blue for contrast, and a green stria for texture. Many of the selected finish solutions were available through a quick ship program, and were available in small yardages, meeting both the design criteria, height restrictions, budget and project schedule. A custom carpeting textile was created to blend the blues and greens with an accent of goldenrod. 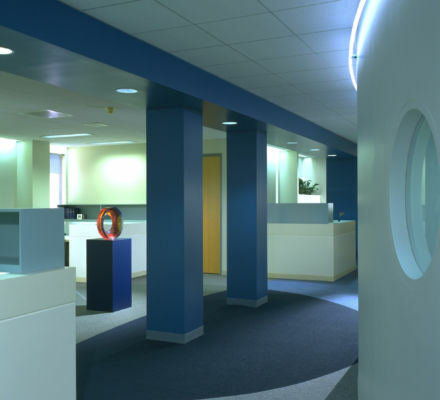 This textile was a high performance solution and was specified throughout the majority of the space. The Verde/eggplant slate chosen for the entry, reception and main conference adds unforgettable saturated hues and texture, in stark contrast to the crisp white sailing through the space. The palette reflects the rhythm of the waves, and beach region, the casual informality of the client. It would not be uncommon to witness the partners in tennis whites during the day. The JSDA design masterfully integrates the existing palette bringing it to a new visual delight. The project is complemented by a significant contemporary art collection and new mono-plant species selected by the design firm. The majority of construction was completed during off-hours. The 25,000 square foot project began in June and completed in September.